Before becoming a vegetables vendor he was a bananas-vendor. He would pile the bananas into a ‘tokri’ (basket), and carry it on his head, travelling from street to street selling them in the Bandra west area. However, a leg injury (caused by an accident) stemmed this mode of livelihood; his injured leg could no longer bear the weight of the ‘banana tokri’ on himself. The injury continues to trouble him even today, when he walks long distances even without any additional weight on him. We hope this injury does not become a legend, for him, like those ‘legends’ so many of us carry within – scars that never heal. However, sadly, I was soon to discover Bharatlal was carrying one such legend within. Bharatlal needed a bicycle as his customers often tell him – ”…‘jaldi bhejo, abhi bhejo, late hoiga to humara order cancel’ (send my order QUICKLY! NOW!! )” This bicycle will help him deliver orders faster, and thus help his business grow. Bharatlal’s family, back in the village, are cultivators of land. They own a small amount of land on which they grow grains. However, the income from agriculture was not enough to sustain them, so he decided to migrate to Mumbai a few years ago to earn a livelihood. Bharatlal has one daughter and two sons, they go to school. His mother lives with them. His father is/was a farmer. Bharatlal’s father, who was mentally unstable, disappeared suddenly one day, 13 years ago, and until today he remains unfound! For Bharatlal, and his family, his father’s disappearance is a complete mystery! They have many theories what may have happened to him, but alas, no proof, nor a body has been found that can be laid to rest with the rituals of our earthly-impermanence. As he told me about his and his family’s various theories of what may have happened to his missing father, I thought to myself, ‘what is the value of the mystery behind our Universe, that behind the origins of man and God, that behind the pursuit of happiness, that behind why our loved one did not return our missed calls, compared to some deeply profound mysteries many people suffer, endure – the disappearance of your father! Of a parent! Of a loved one! Our father being among the handful of ‘firsts’, those super-special people we not only FIRST open our eyes to, but someone with whom we first engage all our senses. For him, someone that special, to just leave, to sail away without a goodbye, to travel without sharing with us his last poem, to bounce without a hand shake or a hug, however feeble, crushed me! I asked Bharatlal, how would he react, what would he think, if someday, hopefully ONE FINE DAY, he accidentally runs into his father!, right here in Mumbai, or his father returns home back in the village; returns as mysteriously as he disappeared 13 years go!? I was soon to realizes just then, that by asking him this, I had unknowingly opened the floodgates of a reservoir that was waiting or wanting to share her burden with the rivers downstream. On hearing this ‘possibility’, maybe ‘a dream come true’ , maybe nothing less than a miracle, a wish, a need, maybe a prayer from his soul, silvery pearls escaped from Bharatlal’s eyes. Those delicate pearls which we wish never escape from the cage of our emotions, especially in front of a stranger, because I was one to him. I had met Bharatlal randomly on the street! I recollect now, what actress Halle Berry had once said – I know that I will never find my father in any other man, how much ever he love me truly, because it is a void in my life that can only be filled by him, my father. This bicycle donation from Ashiesh is actually a birthday gift he wants to dedicate to his dear friend Bharat; as its Bharat’s B’day on Oct 2nd. Ashiesh was pleasantly surprised at the sheer coincidence, that the person he happened to donate the bike to is named ‘Bharat’lal, a namesake of his own dear pal Bharat!  Strange are the ways of our world, I say, and even stranger is kindness and empathy. We can never know whom they will choose to flow to. We just have to keep the floodgates of our hearts open to not only share them, but to receive them too. I must add, I accepted Ashiesh’s donation after he reminded me at least twice or thrice, over a couple of months, when can he send me his contribution. For me, his voluntary perseverance was not just a sign of his sincerity towards the common cause of the donors of Bicycle Angels (provide a helping arm, and not alms) but also a shining reflection of his own empathetic core, and his value of making a commitment to someone. Thank you to Gazi for Bharatlal’s pic with the bike. He is not educated formally, but says confidently can sign his name. The reason he could be formally educated being, their need for food overwhelmed that for the alphabet. Shivshankar has two sons, and three daughters out of which only one daughter is married, the other two are in school, one post school. He had a very poor opinion of the government schools back in his village, saying their standards are pathetic, so they cannot possibly promise their students even a remote chance at a better future by way of it. Shivshankar arrived in Mumbai in 1984. He told me, ‘It is poverty that makes people like us migrate to the cities. Someone or the other, mostly known to us, takes pity on our condition, and to help us he takes us with them to the city where he works. A city that can potentially provide us a good chance at earning our livelihood. Hmmmmmm So, it was his uncle who helped Shivshankar rise from the hole that his circumstances presented him at birth. His uncle, I believe, had a healthy heart. 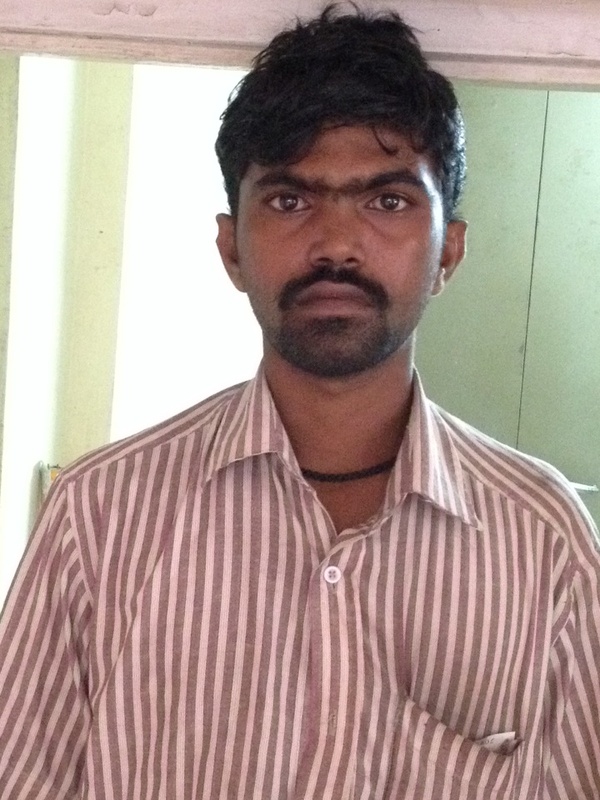 Shivshankar’s father had tilled land belonging to others, a daily wages farm laborer. His family never owned land of their own, but with all four sons getting established, as Dhobis, over a few decades the family managed to pool their resources and purchase some amount of land of their own, back in the village, to cultivate and live on, and thus better their standard of living. The fact that Shivshankar managed to earn enough, not just to feed and educate his family and look after his parents, but also to buy a land they can call their very own, is the happiest realization of his life’s efforts so far, he told me when I asked him about his happiest moment in life so far. That was such a great reward to his work, I thought to myself, that Shivshankar could put his earnings to such use, building from it, over a period of time, an immoveable asset! Now who does not want to built immovable assets in their lifetime! 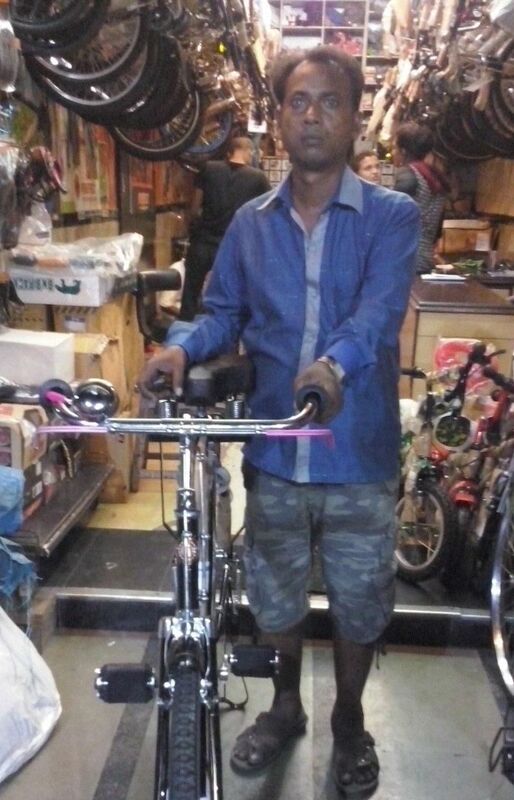 Thank you to Pooja and Bhavin Sanghvi, for purchasing this new bike for Shivshankar, he contributed more than half towards the cost of the same. 83rd recipient – Dreams are our only native land. Eknath has been a courier delivery person since 9 years. 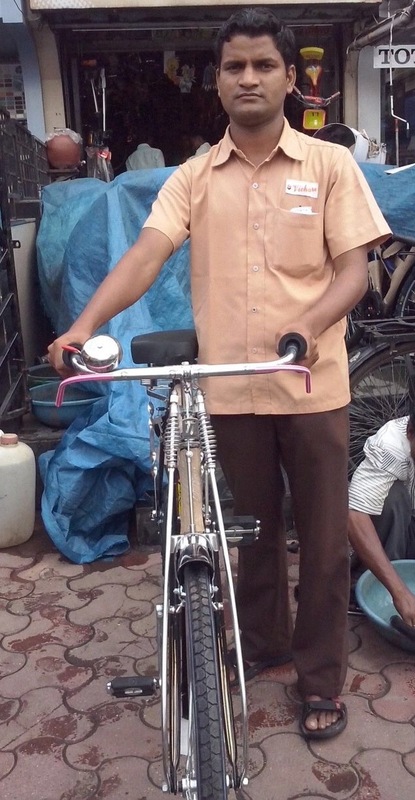 He delivers mail in Bandra area, and has never had a bicycled to execute his job. This will be his first bicycle in this profession. Eknath is born and brought up in Kolhapur. He migrated to Mumbai nearly a decade ago as his father could not afford to pay for his education beyond the 12th Std. His family’s financial circumstances forced him and his brother to migrate to Mumbai; his brother works as a security guard in a company in Mumbai. His sister is married. His father is a farmer and they own a small quantity of land in the village which they cultivate. However, its not enough to sustain them, so his father also works on land belonging to others to make ends meet. Before he came to Mumbai and found a job in the Courier profession, as a delivery person, Eknath worked in the fields with his father and he loved it. He wishes even today that he did not have to work as a courier person, and wishes one day he can return to his village and cultivate their own land. Eknath admitted he has never really know ‘happiness’, however, he is very happy that he has two daughters, and said, ‘…unlike some other people who get sad when they have a daughter, I am overjoyed that I have two! Furthermore, I realized the true value of what my parents have done for me, (so what if they could not afford to educate me beyond the 12th, so what if I had to leave my home and village and migrate to Mumbai for a living), only after I had my own two children. Therefore, stretching himself by even half an inch beyond the earmarked 12 square feet is strictly prohibited, and ruthlessly enforced on all the tenants living in that room. To keep his personal belongings, a bag, there is a ‘kind of hole’ in the wall that is nearly 2 feet x 2 feet and has a depth of 1 foot; so all his wordly belongings in Mumbai must fit in that space only! Moreover, each tenant is allowed to hang their daily wear clothes on a single ‘Kheela’, nail, a iron hook, on the wall. All that they keep aside to wear another day, must fit on one nail on the wall. There are as many Khilas on the wall as many tenants in that room. So, when he has buy things to carry back home to his family, on his annual trips to Kolhapur, he has to shop for them en route to the Bus station or railway station only, as there is no place nor any space in his Mumbai room for him to store any additional stuff in. In the day, if they need to rest, on a holiday like Sundays, the tenants are not allowed to sleep in the day unless they work nights, and can rest against the wall and their lower body cannot occupy more than four tiles, each tile having a dimension of 1 foot x 1 foot. Naturally, stretching of arms and legs is not recommended in the day or night, as it will invariably hit a neighbor tenant. What Eknath, and my rider acquaintance, said to me, put into perspective the value of land in cities like Mumbai, and even New York. Because when I had traveled to New York a few years ago and lived there for a few months for a film workshop, I felt the exact same squeeze overnite, living in a matchbox size hotel room for which I was paying the rates of probably a spacious Bungalow in a premier part of Mumbai! Thank you to Gazi for Eknath’s pic with the bike. 83rd recipient – In your praise will lay your mother’s too. Kumar is from Tamil Nadu. Back in the village, during his teens and early youth, he was a tree-cutter. He would be paid Rs 200 a day, and not have more than 10 to 15 days of work in a month. Fed up of the insecurity and the poverty, he migrated to Mumbai and has been selling idlis since then. He arrived here 5 years ago and has worked every day since. Kumar could not study beyond the 5th because his father suffered from some ailment when Kumar was still in school and thereafter he had to stop studying and earn a living, that’s when he became a tree-cutter. Even today his father remains out of action to work. So Kumar and his brother run the house from their earnings, both sell Idlis in Mumbai. Both do not have bicycles. Their two sisters are married, both brothers and their father funded their weddings. Kumar is married and has a daughter. He was very happy speaking about his family, his daughter and he was quite proud that he can look after his own family and his parents. That really made him the happiest, he said, in spite of his impoverished circumstances. “…. People should take my name with pride if they talk about you! When people will praise your life’s deeds and actions, for me they will be praising me too, because to me it will mean that I must have brought you up well. Now, of the millions of things his mother must have told him, from the thousands of stories of his life in his head, Kumar chose to tell me about this one; one shared by a Mother privately to her son. In what circumstances, we shall never know. What story lies behind it, we will never know. I believe, Kumar was actually acknowledging that his mother gave him a good upbringing, irrespective of the little she could do for her children, because of their unfortunate impoverished existence. It’s that celestial moment, when she inspired in him the will to work hard and earn a honest living, that he remembers most clearly. That’s probably why, it is this very memory that lay at the tip of his imagination waiting to be shared with us. Like a drop of water that rests at the tip of a melting iceberg in summer – she just can’t wait to be shared with the rivers. “But there’s always a story behind everything. How a picture got on a wall. How a scar got on your face. How….. etc., Sometimes the stories are simple, and sometimes they are hard and heartbreaking. But behind all your stories is always your mother’s story; because hers is where yours begin.” ― Mitch Albom. 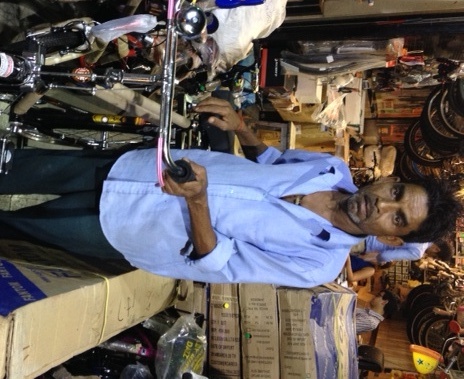 Thank you to Pooja and Bhavin Sanghvi for purchasing this new bicycle for Kumar. Kumar contributed more than half it’s cost.